Chameleons are a type of lizard that changes colors to match its surroundings. They are so unique and are truly amazing to watch in the wild. Sometimes you can't even see them because they are camouflaged to its surroundings so well. I've even see them turn bright white when they are on a wall. Amazingly enough, I've also seen them change 2 different colors...green for a leaf and red for the flower....this is always awe-inspiring. If you are a big fan of chameleons and think they are truly amazing as well, then you will enjoy making some with the following crafts ideas. Take an empty thread spool and turn it into a chameleon. Cover the spool with green paper or crafts foam and paste it on. Trace the front of the spool onto green foam or paper, and then paste that circle onto it. Cut white circle eyes...one bigger than the other and paste them onto the front. Use a black marker to make dots in the eyes...and 2 dots for nostrils...as seen in figure #2 above. Roll a red strip of paper and a green strip of paper...one will be the tongue and the other will be the tail...glue them on. Also cut out a green leaf shape and glue it to the top of the face. Cut legs out of craft foam or paper. 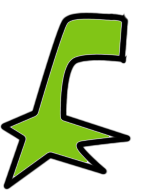 The legs look like backwards #7 shapes and the feet are made from 2 letter 'M' shapes. Here is a printable template of the legs if you want them. Glue 2 legs on one side of the spool and 2 legs on the other side of the spool. Do you want to make a cute cartoon chameleon character that is able to open his mouth to stick out his tongue? Well here is your chance. First, print out this chameleon template. You will notice the chameleon is in two pieces...this is on purpose...cut each part of the chameleon out separately. Then glue the top part of the chameleon onto the top of a clothespin....in front of the metal ring. 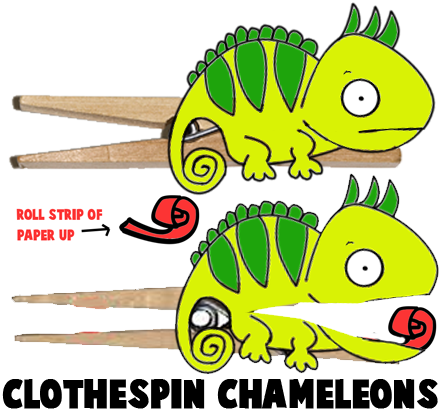 Then glue the bottom part of the chameleon onto the bottom part of the clothespin ...making sure that they match up perfectly. Open and close the clothespin to make sure that the chameleon looks like he is opening and closing his mouth. Take a small strip of red paper and roll it, as seen in the picture above. Then glue it to where the chameleon's tongue should be (on the clothespin), as seen in the picture. 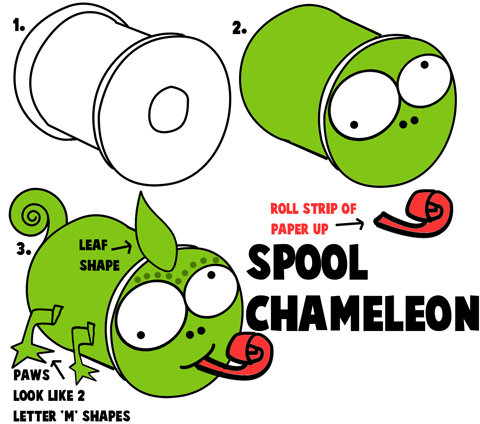 How to Draw Cartoon Chameleons - Learn how to draw cartoon chameleons with easy step by step instructions using basic shapes.